There are books about rare book collecting, and then there are books that are simply bibliophilic in nature -- booklovers' delights. There are a couple coming out or forthcoming that are fun and full of frivolity and worth pointing out to readers of Fine Books. 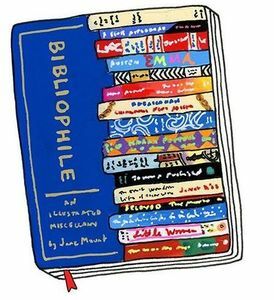 First is Jane Mount's Bibliophile: An Illustrated Miscellany. Mount is a beloved illustrator of personal and dream bookshelves, a series which she calls "Ideal Bookshelves" -- she uses simple drawings and watercolors to paint assemblages of readers' favorite books together on mini-bookshelves, whether or not they own them. Over the years she's made a huge impact on the book-loving internet with coverage in just about every book and design blog out there, and there's good reason, her artwork is heartening and warm, positive and book-celebratory. Her new book, Bibliophile, is a wonderful look at her work, and Mount takes readers behind the scenes of favorite writers' spaces and shelves, bookstores, and their literary cats. It's an airy and charming and beautiful book. Next is Susan Harlan and Becca Stadtlander's Decorating a Room of One's Own: Conversations on Interior Design with Miss Havisham, Jane Eyre, Victor Frankenstein, Elizabeth Bennet, Ishmael, and other Literary Notables. Harlan, a humorist and professor of English at Wake Forest, spoofs decorating culture and English literature in a series of imagined interviews of famous fictional homes and their residents and plays skillfully with literary history. Who wouldn't want to know Lady Macbeth's favorite room in the castle? To round it all off, there's Anne Bogel's I'd Rather Be Reading: The Delights and Dilemmas of the Reading Life. Bogel is a celebrated book fiend, writer, reader, and literary podcaster. This collection of her work is an argument for reading as a lifestyle choice. We couldn't agree more.